In today's world, everyone is using web hosting services for their business. And it is one of the best ways where you can easily get connected to the people all over the world and it is also the best platform where you can showcase your business products and services to the people on the internet. And today you may find some issues while you use your service, so here are the one of the solutions for generating the machine key. Today if most of the people would like to choose Windows hosting for Windows operating system, as their website hosting. And sometimes you may find some of the setting changes difficult. So here is the information on Machine key. Machine key generates a unique key which helps you in a single form because it helps to protect your form Authentication cookies and page level View state. And if you want to run .net framework on your website then you need to generate machine key in your hosting. The very first thing that you need to do is that you need to check the domain name existence. Click on your domain name or If you are looking for domain name registration, you can contact our sales team. 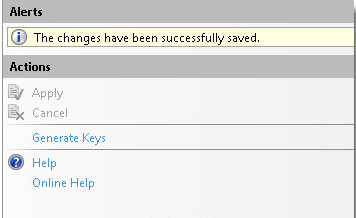 Message will be shown on Alerts pane, "The changes have been successfully saved."